Midway through our night at Singapore airport, I decided that I am definitely too old to be sleeping on the floor…or trying to sleep as the case may be. There are worse airports to spend the night at, but that didn’t brighten my outlook or help my back the next morning. But as we sat on the flight to Tokyo, I was genuinely excited. It has been a while since I have felt like that when arriving somewhere, and Tokyo certainly didn’t disappoint. The rail system is just ridiculous. 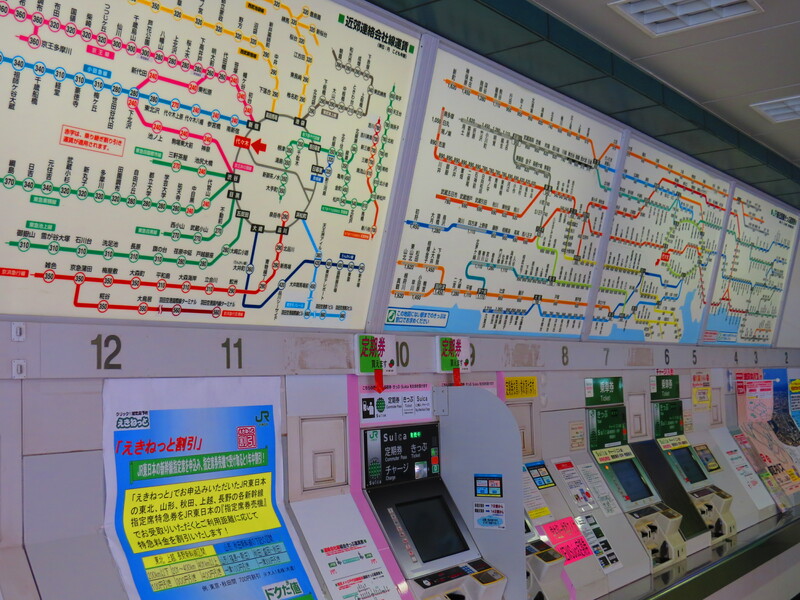 It’s a vast sprawl of lines taking you to any crevice that you want to go within Tokyo and the surrounding areas. What it does mean is that there are always several ways to get to the same destination, so even getting on the wrong train isn’t the end of the world. Just looking at the map and trying to work out fares can be traumatic though, especially after a night lying on an airport floor followed by a seven hour flight. It took us about two hours to get from the airport to the hotel, and it was a welcome sight when we finally found it. The room was small but very comfortable with everything we needed, with some added extras. The toilet had various contraptions attached that you wouldn’t get anywhere else in the world. I won’t go into details, but I can assure you that all were tested and I’m looking into getting them installed at home on our return to the UK. That night as we slept, we were woken in a fairly strange way. At first I thought Katy was jumping on the bed, and it took us a while to understand what was going on. The whole room was shaking, with various items clattering to the floor. We were experiencing our first earthquake. It didn’t last too long, and almost immediately afterwards we were back asleep without a second thought; mainly due to lack of sleep. The next morning we checked the local news and confirmed that it was measured at 5.3 on the Richter Scale. There was no major damage or injuries, and although fairly common in Japan it was the first in Tokyo this year. It was a surreal experience which thankfully wasn’t too serious. So we began to explore Tokyo and it really is a great city. It is by far the cleanest place I have ever been, and I don’t actually think I have seen one bit of rubbish on the floor all week. Although most people cannot speak English, everyone is very polite and respectful. The people we have spoken to are interested in what we are doing and where we are visiting, while recommending places for us to go. It’s a place that if you have the time and the money, you can do pretty much anything; and money is the operative word here. Tokyo is expensive. Being on a traveller’s budget for the last eight months, we’ve gotten used to tightening our belts (unfortunately not literally) and finding ways to reduce costs. Nowhere has it been so important though. Beers average out at about £10 pint, although you can find it cheaper if you know where to go. Food can be tricky as most restaurants don’t have English menus, so trying to work out what things cost can be…err…tricky. Our room had a kettle, so we saved money by eating Ramen (or pot noodles). We did find something that we have had very little of in the past eight months, cheese and red wine. 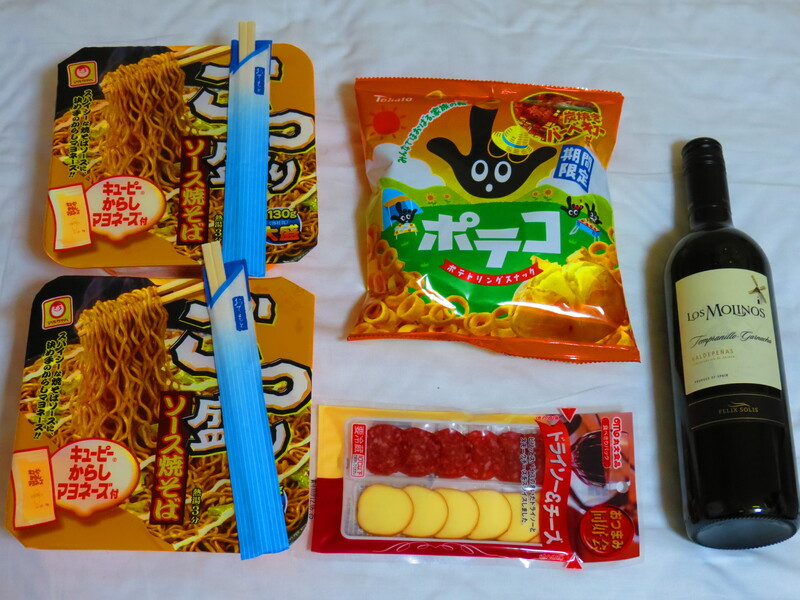 Both were cheap from the 7Eleven, and even though we sat in our small room drinking out of tumblers, it felt like a treat. And with a bottle of wine for £4, we treated ourselves several times throughout the week. We have walked around most of the main districts of Tokyo this week, and a few places have stood out from the rest. 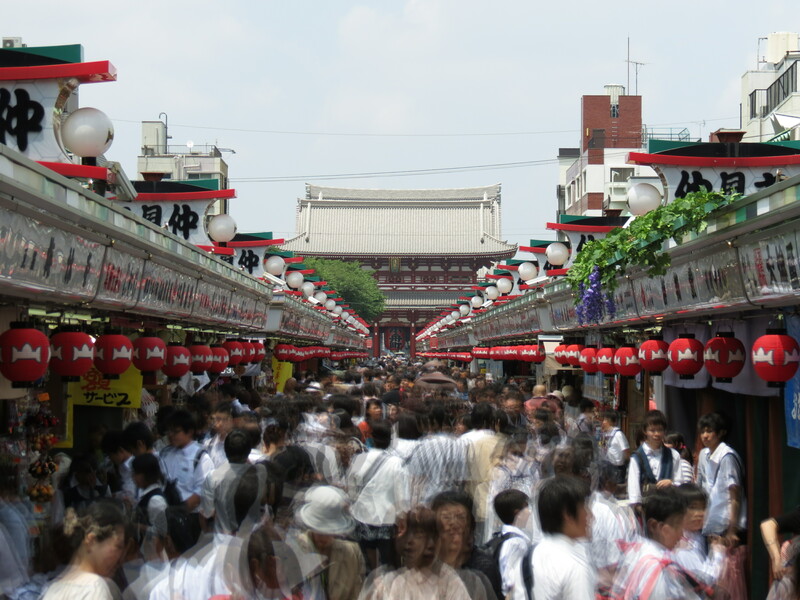 Asakusa was probably our favourite area of the city, with a mix of very traditional buildings and ultra-modern. It has the oldest temple in Tokyo which was built in 628AD, and it’s just a lovely place to take in and watch people. 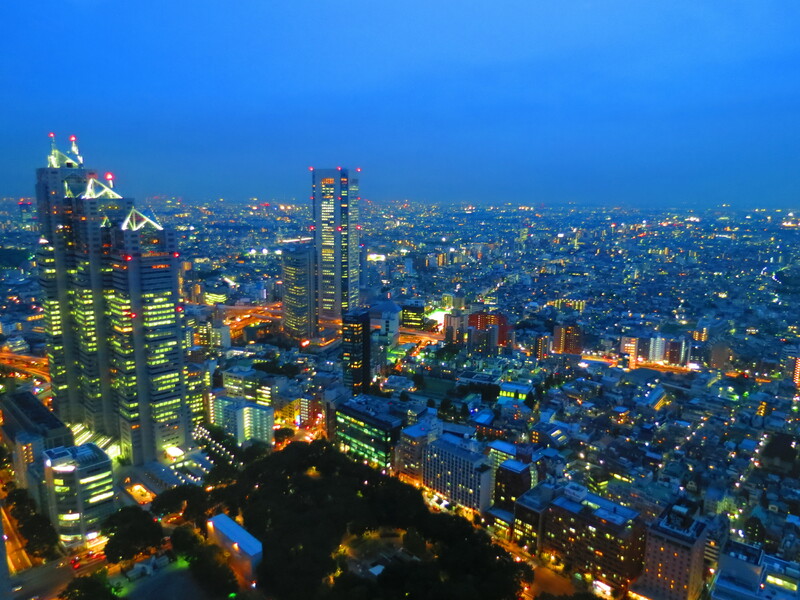 The best place in town for a night out has to be Roppongi, in Tokyo midtown. Here you can find any sort of bar for any budget. The bar that fitted in with our rather meagre budget was Gas Panic. It was recommended as one of the cheap trend bars of the moment, and was basically a hip-hop bar for young Japanese people looking for a good time. It did look like they were having a good time too. With cheap drinks and some great tunes blaring out of the sound-system, I thought it was a pretty good choice. That was until the DJ had a change of heart and began his Rihanna medley. As Katy took to the dance floor, I grabbed another beer. 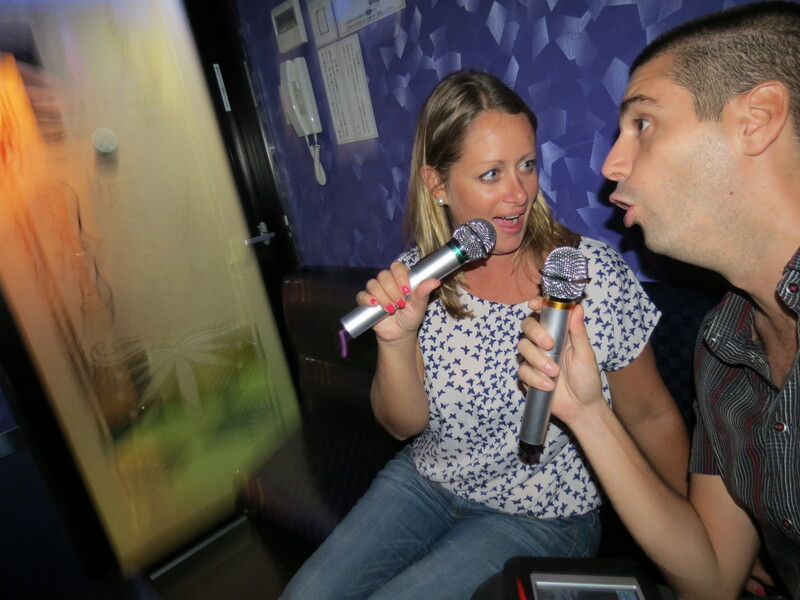 After we were sufficiently lubricated we had planned to go out for a nice meal, but instead we had a McDonald’s and headed to a karaoke bar. We rented a private booth for an hour and we let rip. I’ve never heard such noises come out of Katy…luckily the booth was sound-proofed. 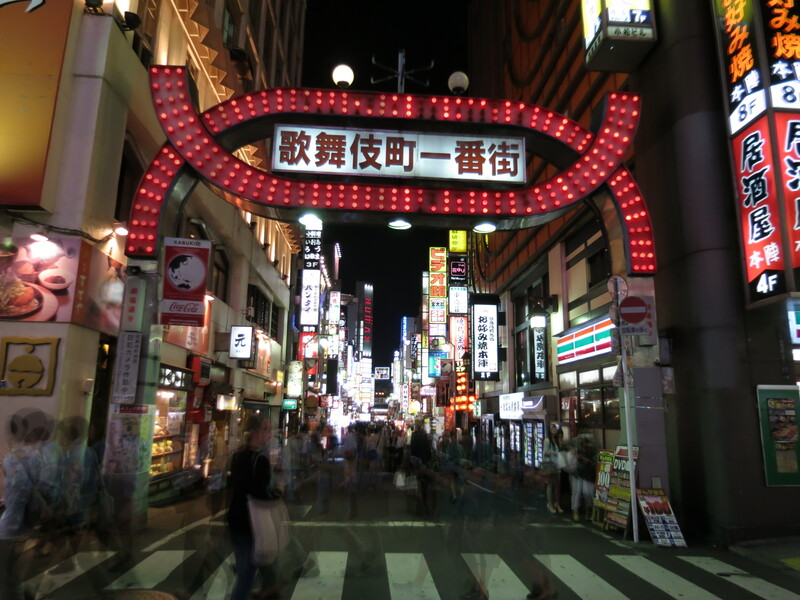 We had a great time, and it is something that I think everyone who visits Tokyo should do during their time here. We have also managed to squeeze in some really nice sushi meals while we’ve been here. It’s more expensive than I thought it would be, after all we are in the birthplace of sushi. The hardest thing is not to keep on taking more as they come around on the conveyor belt. We’ve seen quite a lot of Tokyo in a week, but most of it has just been walking around the different areas of the city. We had a quick look at Tsukiji, the largest fish market in the world. We spent some time looking around some of the big arcades, and I couldn’t resist having a go on a few of the machines. Some of them actually look quite scary, and the locals definitely take their gaming seriously. In Ginza and Akihabara we had a look at some of the electronic gadgets, but there wasn’t really anything too cutting edge. I was picturing robots ice-skating or something like that, but unfortunately I was disappointed. Today we went to Yoyogi Park in Shibuya to see if we could find the Harajuka girls. 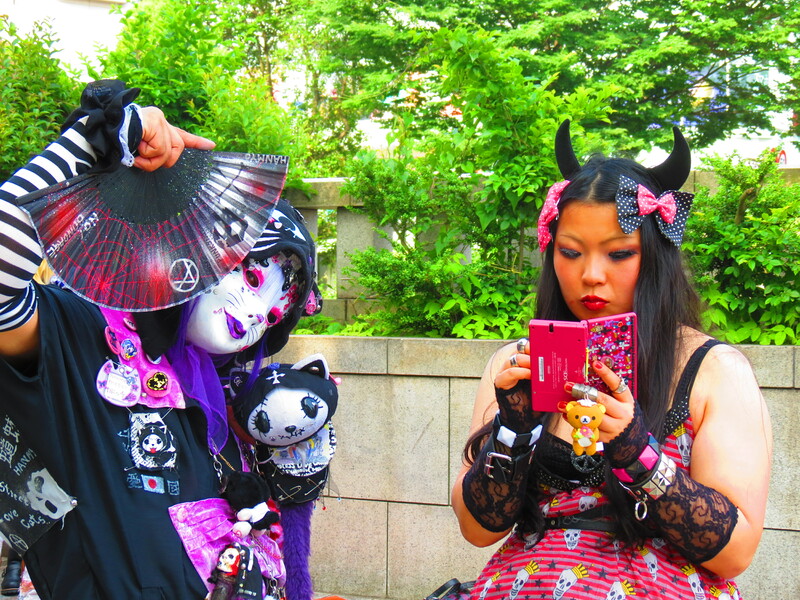 If you’ve not heard of them, they are basically teenage girls bedecked Japanese character outfits (such as Hello Kitty and Manga), goth makeup or punk kimono outfits. We had seen a few throughout the week, but this is the area that they congregate on the weekends. Well in fact we only saw about ten girls dressed up, and they weren’t too happy about getting their picture taken. It was great weather though, and an interesting walk through the park. So tonight we are back in our room with a bottle of red wine, writing this blog. We fly to Ecuador tomorrow to start the second leg of our trip in South America. We have really enjoyed SE Asia, but we are definitely ready to move on now and experience different cultures and food. I will enjoy eating my bowl of noodles tonight, knowing it will be the last one for some time.